College Coaches interested in recruiting our MTC athletes can contact me for more information. Parents with questions about throwing in college can contact me about more information. 1. What Grades and ACT scores do I need to be a college athlete? Here are the NCAA DI and DII minimum academic eligibility requirements. Remember, there is no ABILITY without ELIGIBILITY. 2. How far do I need to throw to be a WALK ON? Here are some average estimates on what a typical athlete would have to throw to walk on, remember these will vary from school to school. I encourage you to inquire with the head coach or throws coach of the school you are interested in attending by emailing and/or find and fill out the questionnaire that many colleges include on their websites. 3. Are there scholarships available for throwers? Parents and athletes should read this article about Track and Field Scholarships by Alan Versaw. It breaks down some of the facts about Div 1 and Div 2 Scholarships. Remember that NCAA DIII schools do not have scholarships, but still provide incredible opportunities for Track and Field athletes. 4. How far do I need to throw to get a scholarship? This is probably the hardest question. The short answer is more than likely farther than the above listed Walk on estimates. But how far, that really depends. Because D1 and D2 schools have a limited number of scholarships that are shared with cross-country, often the best throwers still have limited opportunities for scholarship based on athletics. Many schools have a recruiting rule of thumb that relates to an athletes ability to score points in their conference. i.e. : if based on your high school marks you could already score in that particular schools conference meet, they will consider you for a scholarship. This is difficult for boy's throwers because the SHOT PUT moves from 12lb to 16lb and the DISCUS moves from 1.6kg to 2.0kg. This transition is something that college coaches have to consider when recruiting athletes. More often than not scholarships are split between 2 or more deserving athletes, so an athlete might be offered a percentage any where from 10%-100%. There are several other factors that go into deciding on scholarships, that can't be quantified by just throwing a certain distance. Please read the Alan Vershaw article above. Often there are more questions than answers but if you need help making sense out the college process, feel free to contact me. Check your calendars... 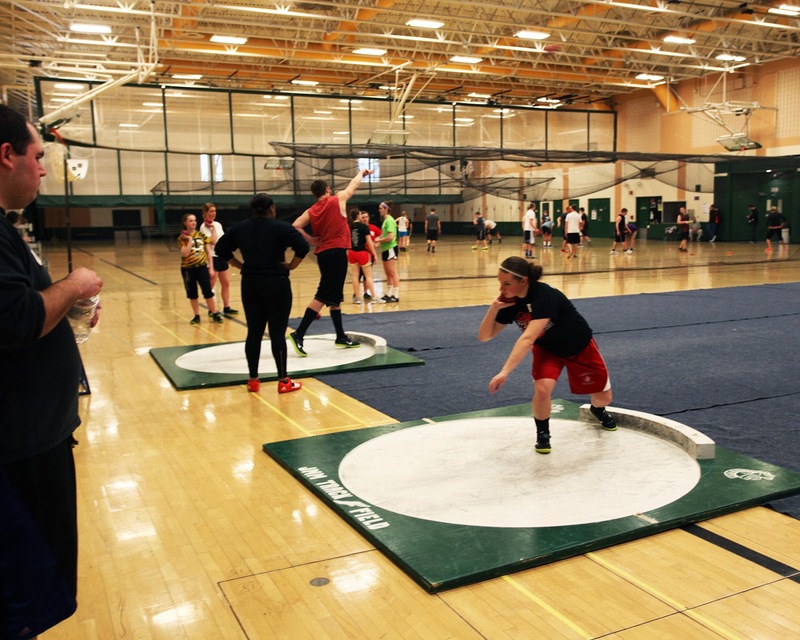 Here are this year's winter MADISON THROWS CLUB session dates. All session will be held at the Madison Memorial High School fieldhouse. Sign up for all 4 sessions or ala cart. Need 1-on-1 drill/technique work or weightroom training, contact me.